Discussion in 'The ETC's of the Modeling World' started by jacquelineo, Nov 19, 2009. PARIS - A 20-year-old top South Korean model who was a fashion week regular in New York, Milan and Paris has been found hanged in her Paris apartment, a police official said Friday. Daul Kim was found dead Thursday by her boyfriend, who alerted French police, the official said. He declined to be named in accordance with policy. Paris police were working under the hypothesis that Kim committed suicide, he said. Kim's agent, Alessandra Bertoldini of the Next modeling agency, said the model's mother was arriving in Paris later Friday. She declined to elaborate. Raised in Seoul and Singapore, Kim modeled in Asia before making her fashion week debut in Paris in 2007, modeling for top brands like Chanel, Dries van Noten and Maison Martin Margiela, among others, her Seoul agency, Esteem, said. She most recently appeared during Seoul fashion week in October. Known for her thick mane of hair -- sometimes dyed blond -- and her quirky sensibility, the 5-foot-10 (178-centimeter) model was celebrated for her sense of style. She was featured recently in a commercial for designer Christopher Kane's line of clothing for British retailer Topshop. 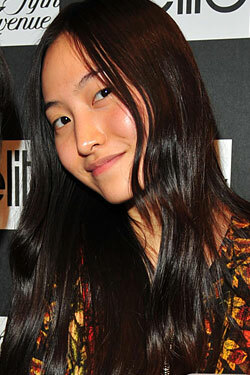 Kim also was an accomplished painter and video filmmaker who had a solo show of her artwork in Seoul. Bloggers in South Korea mourned her death, speculating she felt the pressure of high-fashion modeling and a loss of identity. In an Oct. 30 entry on her blog, Kim wrote she was "mad depressed and overworked," and in another entry said "the more i gain the more lonely it is ... i know i'm like a ghost." The last entry on her blog, dated Nov. 18, was titled "say hi to forever" and carried a video of the song "I Go Deep" by British singer Jim Rivers. South Korea -- which has the highest suicide rate among the 30 nations in the Organization for Economic Cooperation and Development -- has had a string of high-profile suicides over the past year. Former President Roh Moo-hyun jumped to his death in May while embroiled in a widening corruption scandal and the ex-chairman of South Korea's oldest conglomerate killed himself earlier this month. In 2008, top actress Choi Jin-sil committed suicide, following in the footsteps of a fellow actor. A young actress in one of South Korea's popular soap operas also died by suicide. I literally gasped out loud when I read that. Model Daul Kim was found dead in Paris this morning, her agents at Next confirm. "She was a top model and a great friend to all of us at Next. Please respect her family’s privacy at this time of sadness. We will all miss her very much," they said in a statement. The cause of death remains unknown at this time but a source tells the Cut she committed suicide. She will be missed. Last year Daul compiled a series of video diaries for us of her Fashion Week adventures. Watch them here, here, and here. Or just a stupid rumor?! I didn't really follow her, but she seemed so lovely. Omg i can't believe it . Rest in Peace Daul. I mean, she seemed like such a vibrant and happy girl. Always inspiring and such an amazing model. WOW.that is so sad.she always seemed to have some inner demons/turmoil,like Ruslana.